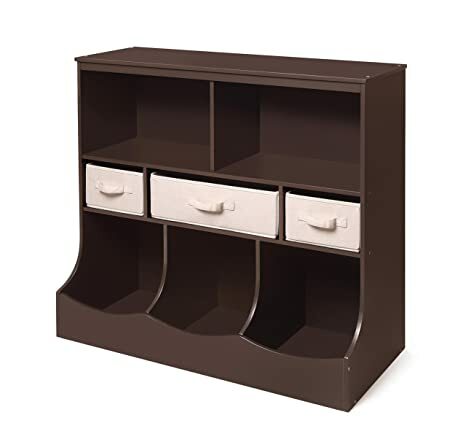 Badger Basket’s Multi-Bin Storage Cubby is a sturdy solution for keeping all kinds of items organized and tidy. From crafts to toys, it’ll be a breeze to sort your stuff and clean up. Features two, generously sized open shelves and three cubby bins. A perfect size for the nursery, your child’s room, entryways and foyers, and family rooms. 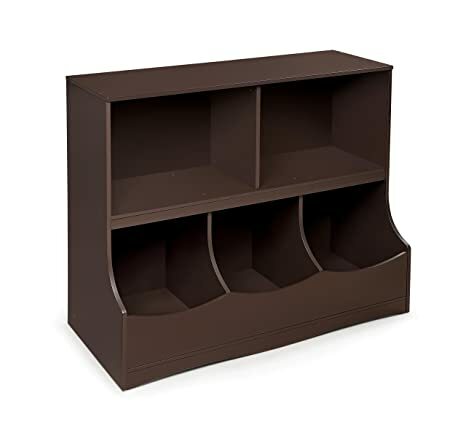 Shelves are handy for books, magazines, toys, linens, DVDs, video games, and more. The three bins are ideal for sorting and separating small items like craft supplies and small toys. Great for kids when they’re learning to put things away. Solid panel construction ensures that your treasured items stay inside the unit – nothing falls out the back or sides. Overall unit measures approx. 37″ wide x 15.75″ deep x 32″ high and weighs 39.6 pounds. Easy assembly with a screwdriver and illustrated instructions. Wipe the wood surfaces clean with a lightly dampened cloth and mild detergent as needed and dry thoroughly. Made with engineered wood. Product may vary slightly from shown and described. Toys and accessories shown with the bins are not included. This item ships in its original carton which may include a photo of the product. All measurements approximate. Complies with all current, applicable ASTM safety standards and CARB ATCM standards. Non-toxic painted finish. Metal hardware. Additional measurements: Shelf areas each: 17.75″ length x 10.75″ width x 13-3/8″ height. Left and right bins are 11.75″ width across the front. Middle Bin is 11.5″ across the front. Bins are 14-3/8″ from front to back at bottom and 10.25″ inside front to back at top. Front height of bins is 6.5″. Height from bottom of inside bin to bottom edge of middle front trim is 14″. Height from bottom inside bin to underside of middle shelf is 15″. From floor to shelf is 18″ height. From floor to lowest edge of bin front panel is 8″ height. From floor to highest edge of the front panel is 9″ height. 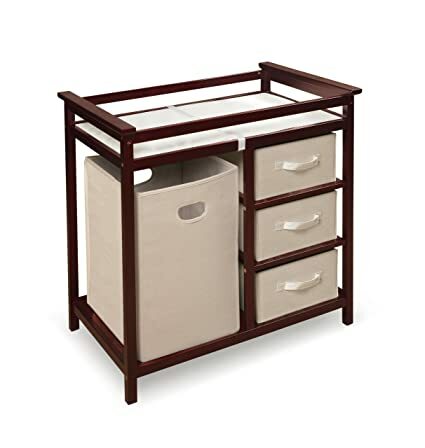 This changing table keeps everything tidy and concealed for a clean look in the nursery. Large hamper for dirty duds, or for storing bulk packs of diapers, blankets, and toys. The hamper easily removes from its shelf to carry to your laundry room. Or, use the hamper elsewhere in the nursery or your house, leaving you a convenient spot in the changing table for your diaper pail or storage. Three pull-out baskets are ideal for changing supplies, clothes, socks, shoes, and toiletries. The baskets are also fully removable for use separate from the table, leaving you convenient, open storage cubbies/shelves. Includes changing pad and safety belt. Changing pad is polyurethane foam covered with wipe clean PEVA (non-PVC) vinyl. Overall unit measures 34. 25″ W x 20. 75″ D x 34. 5″ H. Hamper measures 13. 5″ W x 14″ D x 21. 75″ H. Baskets measure approximately 12. 75″ W x 17″ D x 7″ H. Hamper and baskets are ecru color, canvas-type fabric. Hamper and baskets fold for storage. Just remove the bottom panel and fold flat. Changing area has safety rails on all four sides. Metal support bar beneath the changing surface provides additional stability. Frame is made with multi-layer solid wood; shelves are engineered wood with veneer. Non-toxic finish. Fabric on the baskets and hampers is 80 polyester/20 cotton. For use up to 30 lbs (13. 6 kg). Illustrated assembly instructions included. Actual color/finish may vary slightly from screen display. Wipe the table clean with mild soap and a damp cloth when needed; dry thoroughly. Spot clean hamper and baskets as needed. Never immerse in water. Toys and accessories shown with the table are for illustration purposes only and are not included with the product. Meets all current safety and testing standards. All measurements approximate. Product includes a warranty of 30 Days Parts to the original purchaser. This item ships in its original carton which may include a photo of the product. Badger Basket’s Combo Bin Storage Unit with Three Baskets is a sturdy solution for keeping all kinds of items organized and tidy. From crafts to toys, it’ll be a breeze to sort your stuff and clean up. Features two, generously sized open shelves, three baskets in two different sizes, and three cubby bins. A perfect size for the nursery, your child’s room, entryways and foyers, and family rooms. Great for kids when they’re learning to put things away. You may choose not to use the baskets and instead have three additional open shelves. Solid panel construction ensures that your treasured items stay inside the unit – nothing falls out the back or sides. Wipe the wood surfaces clean with a lightly dampened cloth and mild detergent as needed and dry thoroughly. Spot clean the baskets (never immerse in water). Made with engineered wood. Product may vary slightly from shown and described. Toys and accessories shown with the bins are not included. This item ships in its original carton which may include a photo of the product. All measurements approximate. Non-toxic painted finish. Fabric on the baskets is 80 polyester/20 cotton. MEASUREMENTS: Overall unit measures 36-5/8 inches Wide x 15.75 inches Deep at the bottom (10-5/8 inches deep at top) x 36.75 inches High. Shelf areas each: 17-3/8 inches W x 10-5/8 inches D x 13 inches H (height to lower edge of top trim is 11-5/8 inches). Small baskets: 8 inches Wide x 10 inches Deep x 6 inches High. Shelves for small baskets: 8-5/8 inches Wide x 10-5/8 inches Deep x 6.75 inches High. Large basket: 16.75 inches Wide x 10 inches Deep x 6 inches High. Shelf for large basket: 16-7/8 inches Wide x 10-5/8 inches Deep x 6.75 inches High. Bottom bins – interior width and height: 11-3/8 inches Wide x 15-3/8 inches High. Bottom bins – depth at bottom of bin: 14.5 inches Deep. Bottom bins – depth at top of bin: 10-5/8 inches Deep. 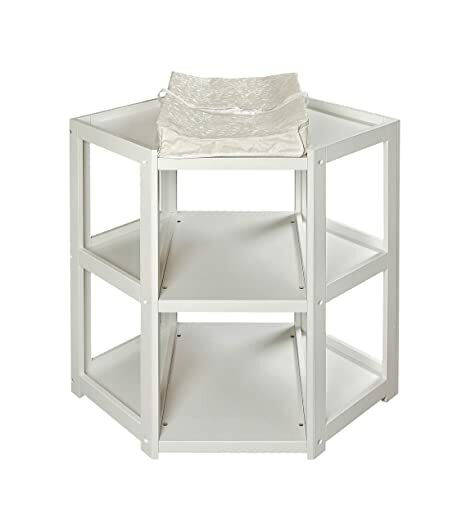 From floor to baskets shelf is 15-7/8 inches H. From floor to top open cubby shelves is 23.25 inches H.
Badger Basket’s Diaper Corner Baby Changing Table is an innovative changing table that capitalizes on normally unused corner space in your nursery. Includes a foam changing pad, fabric changing pad cover, and safety belt. Wipe the table clean. Fabric pad cover is machine washable. Table is wood and MDF. Changing pad is polyurethane foam covered with PEVA vinyl. Overall dimensions: 40.5 inches L x 31.5 inches W x 35 inches H. Adult assembly required. 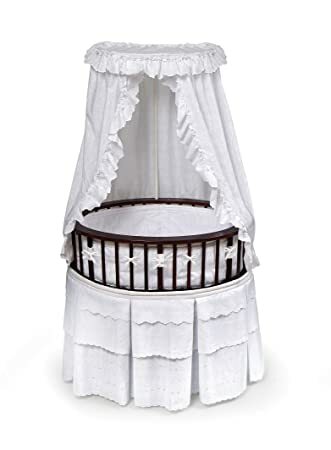 Badger Basket’s Elegance Round Baby Bassinet with Canopy is a complete unit with bassinet, bedding, and foam pad. The long skirt hides a storage shelf. Graceful, two-position, height adjustable canopy shades the interior. Also includes caster wheels (never move the bassinet with your infant inside). All bedding is machine washable. Frame is made with wood, MDF, metal, and plastic. Overall unit measures 32 inches L x 32 inches W x 49 inches H. Adult assembly required. 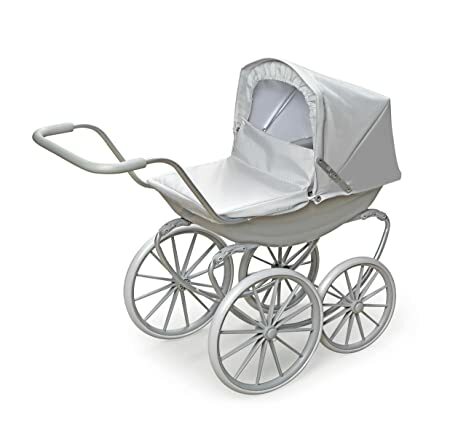 Badger Basket’s Elite Oval Baby Bassinet with Canopy is a complete unit with bassinet, bedding, and foam pad. The long skirt hides a storage shelf. Graceful, two-position, height adjustable canopy shades the interior. Also includes caster wheels (never move the bassinet with your infant inside). All bedding is machine washable. Frame is made with wood, MDF, metal, and plastic. Overall unit measures 32 inches L x 25 inches W x 53 inches H. Adult assembly required. 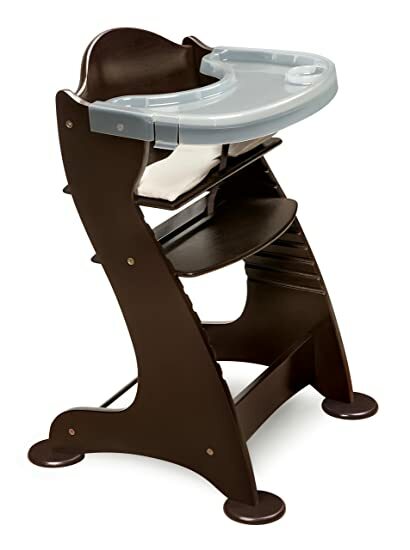 The Embassy Baby High Chair is a complete, wood high chair for your baby, a booster chair for your toddler and preschooler, and an attractive chair for tweens, teens, and adults. Two trays included. Adjustable five-point harness. The padded seat cushion has a fabric cover. When your baby has outgrown the high chair, remove the tray and the front safety bar and adjust the seat and foot rest positions. Eventually the chair can be used for adults with one panel as the seat and feet placed on the floor. The Embassy is for use from approximately six months (when your child can sit unassisted) to a maximum weight of 175 pounds (79.5 kg). Adult assembly required. 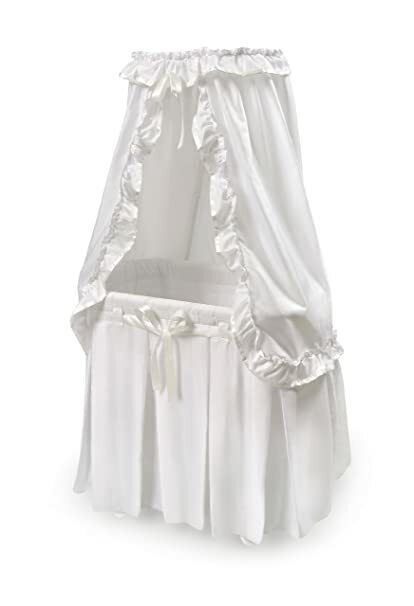 Badger Basket’s Majesty Baby Bassinet with Canopy is a complete bassinet with bedding (liner/skirt, fitted sheet, canopy, foam pad). It features a convenient storage basket hidden beneath the skirt and the wheels can be flipped up to rock the bassinet like a cradle. The bedding can be removed from the metal frame for machine washing. Overall unit measures 30.25 inches L x 16 inches W x 53 inches H with the wheels down (51.5 inches with the wheels up). Adult assembly required. Badger Basket’s Portable Bassinet n Cradle with Toy box Base converts to a handy toy box when your infant outgrows the comfortable bassinet. Also has a large mesh basket for storing nursery necessities in the first few months. Bassinet can be detached from the base and used as a bed for Baby anywhere in the house (do not use in car or carry with baby inside). Flip up the caster wheels for rocking motion. Complete bedding set included. Adjustable canopy. Frame is made with wood, MDF, metal, and plastic. Overall unit measures 32 inches L x 24 inches W x 42 inches H. Adult assembly required. 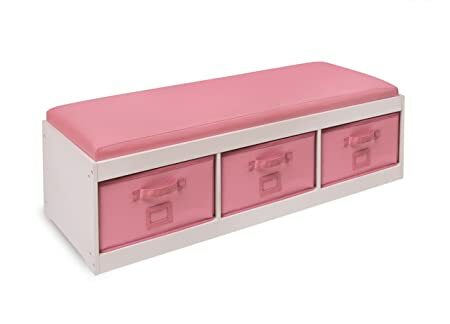 A comfortable bench with ample storage below to organize toys, stuffed animals, clothes, videos, games, linens, towels, and more. Classy, durable, wipe clean, faux leather covering on cushion and bins. Sized for children to enjoy as a reading spot, or a place to perch while dressing and putting on shoes. Convenient for kids rooms at the end of a bed or under a window; or hallways, foyers, guest rooms, and more. Wood frame measures 45. 25″ W x 15. 75″ D x 11. 75″ H. With the cushion, the unit is 13. 75″ H. Cubby areas are each 14. 25″ W x 15″ D x 7. 75″ H. Bins/baskets measure 4″ W x 15″ D x 7. 5″ H. Card holders on front of bins allow you to label them and know what is inside at a glance. Handles on the front of the bins make it a breeze for even the smallest hands to pull open to search the treasures inside. Bins are reinforced with binding on all edges. The bins are fully removable for use anywhere in the house, and they fold flat for storage if not being used. Solid back panel prevents the baskets or other contents from being pushed out the back Top cushion is secured to the top panel which can be lifted/removed like a lid allowing full view of everything inside. Bench supports up to 200 pounds. Bench made of made of engineered wood. Wipe clean with a damp cloth and mild detergent and dry thoroughly. Wipe clean fabric is Polyurethane Leather; inside the bins is 65 Polyester/35 Cotton fabric lining. Cushioning is one inch thick polyurethane foam. Wipe/spot clean the bins as needed. Never immerse in water. Adult assembly required. Illustrated instructions included. This item ships in its original carton which may include a photo of the product. All measurements approximate. Product may vary slightly from shown. Props and accessories shown with the unit are for illustration purposes only and not included. Badger Basket’s London Doll Pram is the height of style for strolling with a favorite doll! The oversized, spoked wheels and smartly designed metal chassis offer an ultra-smooth ride. Fixed wheel position (non-swiveling) makes it easy for little ones to push around and control its path. Fabric boot cover is easy to remove and reattach. Bedding set includes a stuffed pillow and mat. Thickly padded handle. Fits 18 inch dolls such as American Girl, My Life As, Madame Alexander, and Our Generation; and also fits 15 inch American Girl Bitty Baby dolls and 14.5 inch American Girl WellieWishers dolls. Fabric canopy and boot are made with 100 Polyester (gray) and 85 Polyester/15 Cotton fabric (white). Padded mat and pillow are made with 85 Polyester/15 Cotton fabric with 100 Polyester fill. Pram body is made with PP plastic. Metal chassis and handle are made with coated iron metal. Wheels are made with PP plastic hub with an EVA rubber tread. Handle is padded with PVC-free EVA rubber padding. Designed for dolls up to 18 inches. Overall assembled dimensions: 32 inches L x 14.5 inches W x 29.5 inches H. From the rim of the pram to the floor is 17.5 inches. Height of handle from the floor is 24.75 inches. All measurements approximate. Wipe and spot clean as needed. Adult assembly required (tool included). Illustrated instructions included. This item is to be used with dolls only and is never to be used with real infants or pets. /! WARNING: CHOKING HAZARD – Small parts. Not for children under 3 yrs. Product complies with all currently applicable safety standards. Product includes a limited warranty of 30 Days Parts to the original purchaser. Doll and doll clothes/accessories not included. Product may vary slightly from shown and described. Props/accessories shown are for illustration purposes only and are not included with the product. Actual color/finish may vary slightly from screen display. This item ships in its original carton which may include a product photo. Badger Basket’s Shelf Storage Cubby with Three Baskets is a sturdy, modular storage solution for keeping all sorts of items tidy and out of sight. Can be stacked with other bins to expand your storage capacity. Shelves are handy for books, magazines, toys, clothes, linens, shoes, VHS/DVDs, video games, and more. The three baskets are ideal for sorting and separating small items.